From gowns to day dresses, parasols to hats and fans, Costume Parisiens celebrates French fashion and culture during the glamorous early years of the 20th century. 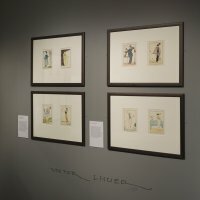 The exhibition presents a stunning collection of vividly illustrated fashion plates from 1912 through to 1914 and runs until the 30th of March. 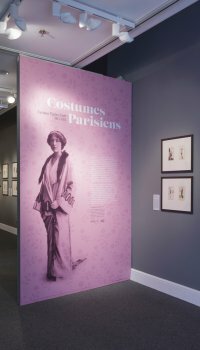 One hundred years after the publication of the fashion magazine Journal des Dames et des Modes (1912-1914), the exhibition features almost 150 of the Journal’s unique fashion illustrations, known as Costumes Parisiens. In 1912, while the first fashion plates were under production, Sir Alfred Chester Beatty was negotiating the purchase and renovation of Baroda House, London. The following spring, Beatty set sail for England, accompanied by his children and soon to be second wife, Edith Dunn Stone. New York society acclaimed Edith as one of the ten most beautiful women in America. Beatty and Edith shared a love of art and ancient literature and she encouraged his evolving collecting practices. It was likely the fashion conscious Edith who prompted him to acquire this fashion magazine. Each publication included a number of pochoir (stencil) prints. The medium particularly suited the simple lines and vivid colours of contemporary fashions. Most of the artworks in this exhibition are devoted to ladies’ fashions. Many of the women are shown participating in various activities, but even more depict women in various poses, highlighting their casual daywear or elegant evening gowns. The most frequently represented and probably most well-known artist was designer and illustrator George Barbier who contributed almost 30 original prints to the magazine, many of which will feature in the exhibition. Others included Léon Bakst, made famous by his costume designs for the Ballet Russes, and Bernard Boutet de Monvel, who designed men’s clothes for couturier Paul Poiret. The fashion houses of the nineteenth century, like Worth and the Callot Sisters, had helped to make Paris a leader in fashion design. By the early twentieth century couturiers like Paul Poiret – known in America as the ‘King of Fashion’ – were producing revolutionary designs that cemented Paris as the fashion capital of the West. Poiret fantastically, and scandalously, eliminated the corset, creating clothes that followed the natural contours of the body. His ground-breaking designs helped to open the door to talented young designers, like Gabrielle ‘Coco’ Chanel, who would come to dominate post-war fashions. The early 1910s were characterised by a rich and exotic opulence. Designers drew upon the low neckline, empire waist and narrow skirt of Neo-Classical France and were inspired by Orientalism to produce modern French versions of pantaloons, turbans and kimonos. Stimulation even came from contemporary art movements, like Art Nouveau and Cubism, with the use of bright colours, rich fabrics and bold patterns. As haute couture became an increasingly important part of the French fashion industry, fashion plates became miniature masterpieces advertising the latest creations designed or inspired by the best Parisian couturiers. Only a small number of high quality, limited edition fashion magazines were produced in Paris in the 1910s and the Costumes Parisiens on display in this exhibition serve as a stunning and vivid record of Parisian culture and fashion in the last years of the Belle Époque. The inclusion of fashion plates in the Library’s collections is a testament to the diversity of the collecting tastes of the great Chester Beatty. We are grateful to the Department of Arts, Heritage and the Gaeltacht as well as RTÉ Supporting the Arts for supporting this exhibition and to the National Museums Northern Ireland for their generous loan of contemporary costumes.